Okay, that got your attention, didn’t it? The expression was one used by a friend on our recent trip to Vegas, where we enjoyed a number of meals that were absolutely wonderful. I think what she meant to convey was that feeling you have when something is so close to perfect it makes you hold your breath. There is a euphoria that comes over you as you soak in the experience. I’ll try to show you what I mean with my next few posts. I will start with the classic foodie “wow” and then proceed with other special experiences. One night we booked at a restaurant owned by a chef my husband has followed since he started working in kitchens. For 30 years Martin has been looking through Joel Robuchon’s cookbooks and following his restaurant endeavours. 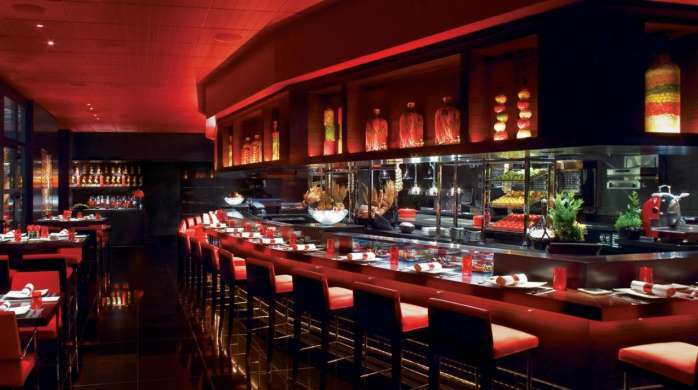 Of course, Chef Robuchon was not in the kitchen the night we were there, but his touch was in every dish. A kitchen that arranges salad leaves with tweezers is not your everyday kind of place. We really wanted to sample a range of items, so we booked at L’Atelier, where the a la carte menu is larger.The kitchen is open so that you can see much of the work as it happens. There is also the potential to spend a little bit less money, although this is not a cheap evening. But then like I said, we don’t eat like this every day! We all chose a few courses, and decided to have wine with dinner. As we sat marveling at the room with all its food displays, we truly felt in the presence of greatness. The sense of anticipation was exciting. They set the tone with an “amuse bouche” and boy, was this first taste amusing! A parfait with foie gras and milk foam. Not for the faint at heart, certainly, but that’s one of the reasons we work out, after all. My first course was “Soy glazed kampachi with endive salad and light mustard dressing”. Kampachi, or kingfish, is a beautifully tender and flaky white fish. The glaze was perfectly balanced with the dressing in the salad, both providing intense flavours to lift the more delicate fish and salad but not overpower them. Martin had a classic dish, “Traditionally poached chilled duck foie gras”. It was served simply with a few toast points that were perfectly crisped. Such decadence is almost enough to make one feel guilty, it’s so enjoyable…At least with your clothes on! But we had only just begun. We went on to our second courses, and our friends had similar moans of delight with their dishes. How could pork chops be so delectable? Martin’s Crispy langoustine fritters with basil pesto” was ethereal they were so crispy. I had “veal sweetbread with fresh laurel and stuffed romaine lettuce”… yes, stuffed lettuce! I adore sweetbreads, and they are not an item on many menus. They were crispy on the outside and deliciously melt-in-my-mouth rich and smooth on the inside. The lettuce had a complimentary savoury flavour to it, I believe created by the foam they had made for it. I was in heaven. But there was still more. The service team would be gliding back in to deliver more delights. They were practically invisible until we needed them, and their knowledge of the food was impeccable. For the last savoury course, I chose “Caramelized quail stuffed with foie gras served with mashed potato”. Martin had “Maine lobster salad with a sherry vinegar dressing”. Our friends enjoyed a sea bass in a coconut curry (poured over the fish at the table, enveloping us all in its exotic aroma), and more foie gras (why not!) My quail was exquisite, delicate and rich at the same time with the foie gras stuffing and the potatoes that were whipped within an inch of their life. I felt a bit like Alice in Wonderland, eating this miniature dish. Martin’s lobster was prepared “a la minute”; you could practically smell the sea air. We hummed as we ate, we were so contented. Of course, I could not leave without having dessert. And really, at such a place, why not order the souffle? “Green chartreuse soufflé, pistachio cream” was the description on the menu. I was completely intrigued. It is prepared to order, so we sipped the last of our wine as it cooked, and then had just started stirring our cappuccinos as it arrived, like a piece of art to a museum exhibition. The ice cream was in a frozen ceramic egg, and the souffle was still rising as it arrived I’m sure. We all gasped in awe as it was set down. I took the first bite of souffle, and drifted away on a cloud with the elegant texture and subtle liqueur flavours in my mouth. The ice cream was an exciting contrast to taste, being richer and cold versus hot. I felt as though I had just watched the grand finale at a Broadway show. I was completely satiated. We spent hundreds of dollars for dinner that night, and it was worth every penny. It’s not something we do often, but that’s okay, because the memories last a lifetime. To share the evening with friends who were equally as interested and impressed with the experience was also a real treat. I just consumed the few edible parts of what was called a sandwich by a shop in Revelstoke that shall remain nameless as I hope this was an unusual occurrence. It has prompted me to write this post, thus preventing further such lunchtime tragedies. This sandwich was not quite as pathetic as a BLT I once had that was missing the bacon (1/3 of its identity!!) Dare I say there is such a thing as sandwich etiquette? 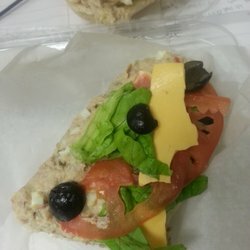 If you are taking orders in an establishment that makes sandwiches, please TAKE THE ORDER CORRECTLY AND FOLLOW UP TO ENSURE IT GETS MADE CORRECTLY. (Do I sound like a Seinfeld episode?) I ordered a vegetarian sandwich on multigrain. My companion ordered turkey on white. I got vegetarian on white, and he got turkey on multigrain. I would have preferred waiting when the person handing over the bag discovered the error rather than eat something I didn’t order. When including vegetables such as cucumbers and tomatoes in a sandwich, SEASON WITH SALT AND PEPPER. Even when you’re using the freshest ingredients from your own garden, a touch of seasoning won’t hurt, and with the commercial groceries most establishments use, salt and pepper can be life savers in elevating the taste of the finished product. Remember, NOT ALL MEATS & CHEESES ARE CREATED EQUALLY. Choose one that fits the tenor of the rest of your sandwich. Tomatoes and lettuce from the garden deserve something more than a Kraft Single or a slice of processed turkey. 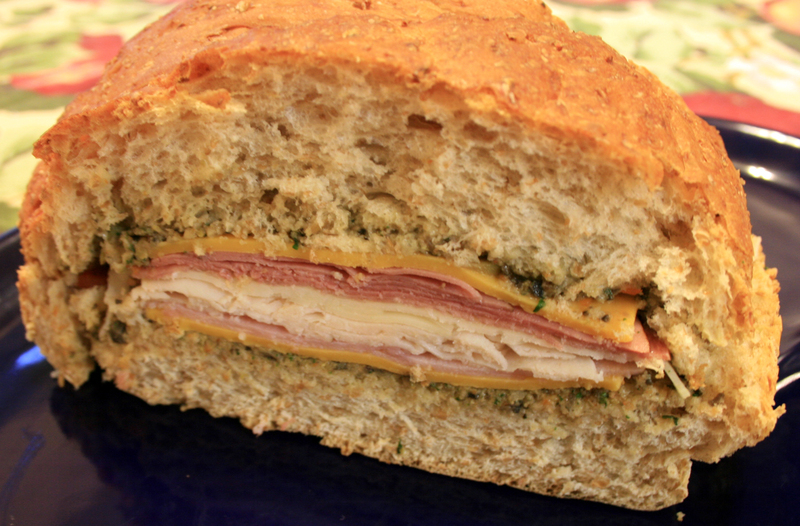 A sandwich out of proportion – too much bread versus filling. It’s also hard to fit in your mouth! 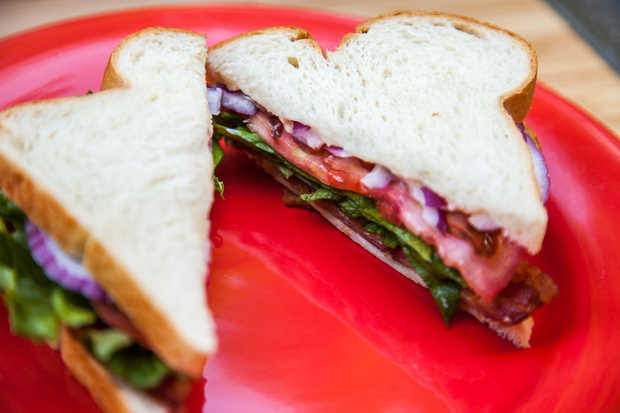 BUILD YOUR SANDWICH PROPERLY so it holds together as you eat it. No one wants salami slapping on their chin, or tomaatoes and cheese sliding out the back end on the first bite. The bread or bun needs to hold together, not be so soft that a spread or other moist filling makes it go squishy. If it’s toasted, then don’t wimp out – make it crispy! Otherwise it’s just warm bread. Don’t use anything too crusty though, or you won’t be able to bite through the whole sandwich. Tomatoes, cucumber and other slippery ingredients need to be not-too-thick, or they will slide around too much. Try to put other ingredients in between two slippery ones if you have them. Lettuce works best if it’s in bigger pieces, or entirely shredded. Little torn bits don’t give even distribution. Bigger is not always better. You should be able to fit the entire width of the sandwich in your mouth, so you can taste the whole thing. Dividing lunch components so they don’t squash each other or leak is important for your enjoyment. PACK YOUR SANDWICH PROPERLY. If you’re not eating a sandwich immediately then this is an important element to enjoying it later. Squishy ingredients are best wrapped separately, to be added just before eating. Bread softens when wrapped, especially with added fillings, so consider that when choosing your bread in the sandwich-making phase. Don’t drop an apple on top of it. 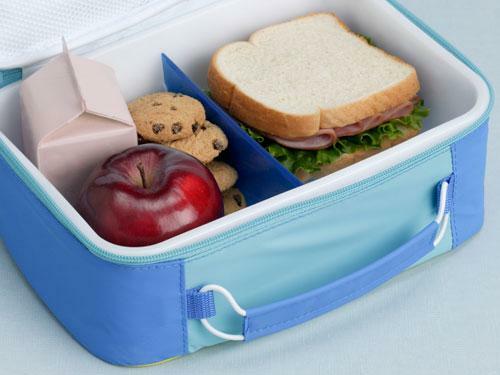 If you must pack harder things in with your sandwich, think about a plastic container, or pack those items under the sandwich in your lunchbox or bag. Be food safe. If your sandwich has dairy, meat or fish it should stay as close to fridge temperature as possible until you eat it. Use an insulated container and cold packs if need be. Now, that’s not so hard, is it? Trust me, you won’t regret taking a moment to appreciate this simple portable meal. Show your sandwich some respect and you will feel better about yourself all day. Tonight I’m in Rossland, a ski bum town in winter and a mountain bike Mecca in summer. This time of year it’s just the friendly locals and me, who liked the look of the funky B & B here better than the hotel in Trail where I am doing my seminars tomorrow. Good decision – this is one cool place! Once on a roll one should continue, don’t you think? 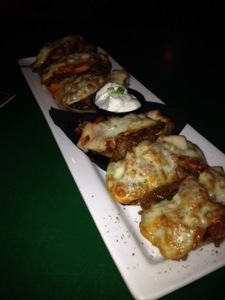 The server mentioned it was wing night but I can’t eat a pound of wings alone so I compensated by peering potato skins, which she advised are “awesome”. They should be here any minute – hey look! Nasty habit number two, check ! I might have had an easier time eating the wings, but what the heck. Caramelized onions, tomato, bacon, smoked cheddar… And the menu does say they’re “dressed “, not “garnished”. Not for the faint of heart this stuff. If you’re a movie fan like me, you may know that Rossland was the real-life town used in the Steve Martin adaptation of the classic tale of Cyrano. This pub doesn’t look big enough to be the one Steve and his fireman pals frequented in the movie but it is just down the street from the Fire Hall 🙂 if you’re not a movie buff, you can enjoy the real history of the place, worthy of a movie script. The place is named for a contraption built by a local fellow that was meant to operate like a helicopter. It did get off the ground and cleared the building but then crashed horribly. Luckily the inventor was not killed but he was smart enough not to make another attempt. I feel it’s a worthwhile thing to toast his good luck. You know, a great dining experience doesn’t have to be fancy, it just has to be true. This holds for any customer experience I think. I teach people that to deliver a WOW, you have to consistently and constantly provide an experience which exceeds customer expectations. I don’t expect white glove service at a pub. I expect a good time from tasty food and drink and friendly, knowledgeable service. The gal who has served me tonight is fantastic – the kind of server an owner usually wishes they could clone. She is younger than me by probably two generations and yet she called me sweetheart when she came to see how I was doing. I loved it! 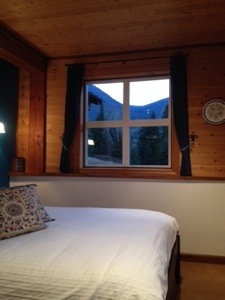 Barn Lodge B & B, as it operates on the same level – quaint, cozy, true to itself. 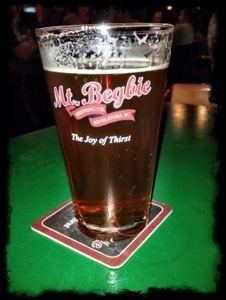 Kudos to you, Rossland, you know how to enjoy life! PS. I’ll post links for these great places in my mobile posts as soon as I’m home. I saw a fantastic YouTube video this morning, about a great food service experience. It made me think, perhaps sometimes we might have a better experience if we started out by being better customers. We are always harping about staff being surly or uninterested but if we start off on the right foot, with a smile or a friendly greeting, that couldn’t hurt, right? I think that’s one of my favourite reasons I enjoy cooking. Sharing food is almost always a pleasant experience (except say, when your kids don’t appreciate your hard work spent on Sunday dinner). Food cheers people up. You have to be careful not to over-use that sentiment – the odd tub of Haagen-Das or Ben & Jerry’s to drown heartbreak or other sorrows is a worthy remedy, but it shouldn’t be used every time you have a bad day. Besides, wouldn’t you rather have a positive memory attached to such a good treat? Food memories are important in our lives too. That’s how we decide on what we define as comfort food. Having tuna casserole on cold winter nights while sharing family stories made it one of my childhood faves. And associations of food with other people or places helps to strengthen memories, too. I still remember a summer of “huckle-blue-toons” with my cousins while vacationing at Kootenay Lake in B.C. Those prolific wild berries (we could never figure out if they were huckleberries, Saskatoons, or blueberries) were in pancakes, pies, muffins, and on our hands and clothes, too. Memories like that help me when I am wine tasting; the smell and taste of that experience solidifies “blueberries” in my olfactory system. I am often inspired when experiencing new flavours to try and add them to my mental catalog for future reference. 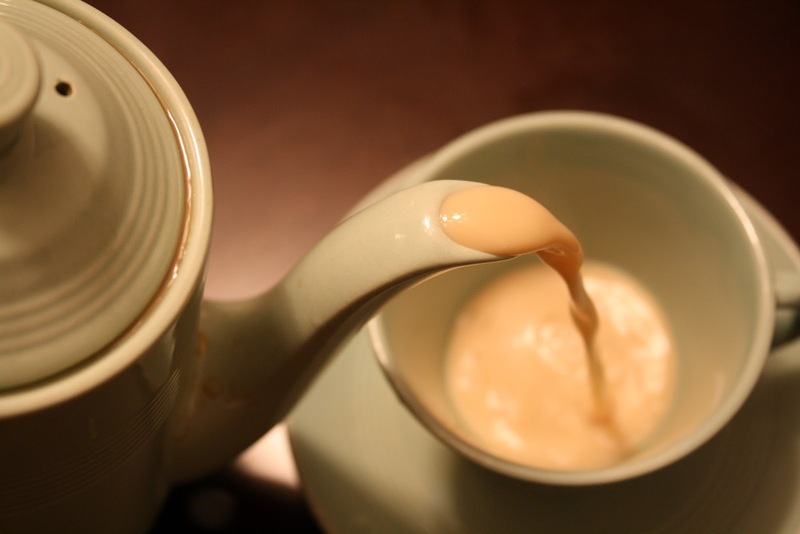 A whiff of cardamom from the chai at an Indian restaurant was an exciting aroma I wanted to remember. It became the impetus I needed to create an exotic version of rice pudding one night at home. Back to the idea of being a good customer… if I remember a good time and try to repeat that or share it while I am out shopping or dining, can I influence the employees I deal with? 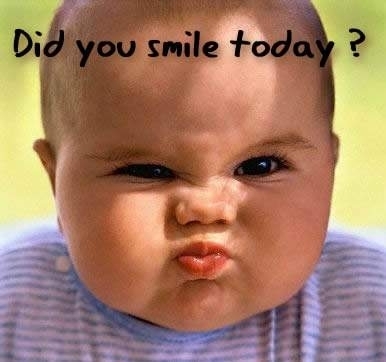 I think there is hope; they say that even clinically depressed people feel better after smiling for even a few minutes. (Don’t get me wrong – I am not trying to insinuate that most service staff are clinically depressed.) If it doesn’t work, all I have to do is keep my sense of humour. Laughing is much better medicine than crying. So, in an effort to give you more ways to keep smiling, here is a link to a fellow blogger who muses about the humour and silliness in everyday commuting, Train Pains… and here is the link for that wonderful video. I would like to ask you a question … what is more important – service or product? If you go somewhere, like to a restaurant, and the food is amazing but the service is horrible, will you brave the service again for the sake of a good meal? Or, is it the other way around – you will sacrifice on food for the sake of a great server? I know that ideally we want the entire experience to be wonderful, but where are you willing to skimp? I am working on starting a company sharing my expertise in guest service, so I would like to ask you for the sake of market research if you will cast your vote in this debate. Please feel free to post other comments as well; I want your opinion!